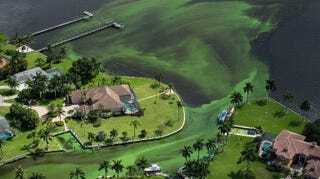 Fourth of July celebrations along Florida’s Treasure Coast were decidedly muted yesterday, thanks to a putrid, toxic algae bloom that continues to fester days after Governor Rick Scott declared a state of emergency. Still, after receiving numerous complaints last week, the Army Corps announced that it would start reducing the flow of water from Lake Okeechobee. How much longer coastal residents are going to have to endure vile green goo remains unclear.